Home » Face » Highlighter » I was not a fan of highlighter till I tried the Becca Shimmering Skin Perfector in Moonstone and then it was love! I was not a fan of highlighter till I tried the Becca Shimmering Skin Perfector in Moonstone and then it was love! If there’s one product that has changed my mind about using highlighters, it is this – the Becca Shimmering Skin Perfector. I bought this on a whim a few months ago, when I was doing yet another SpaceNK haul (Yes I shop a lot there!) and for some reason, I got it in my head to try this liquid highlighter. I don’t talk a lot about using highlighters, here on the blog, because I don’t use them a lot. I never got the hang of it, and it wasn’t something I was terribly interested in, as in hot weather, it has a tendency to make you look sweaty and oily as opposed to glowy and healthy. This one however, changed my mind and had me reaching for it often. A true sign of a keeper! But what is it about this Becca highlighter that had me changing my mind about using a highlighter? Well, I think it’s to do with its texture. Despite the name, the Shimmering Skin Perfector is not very shimmery at all! When I think of highlighters, I tend to think of products with glitter or shimmer or something highly reflective. 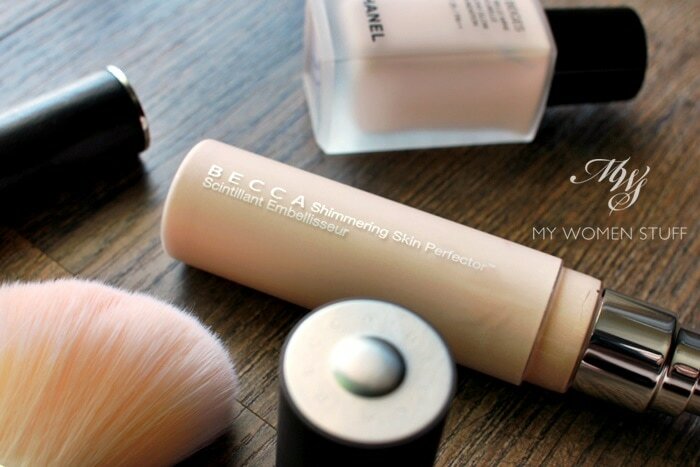 The Becca Shimmering Skin Perfector is a soft liquid, with very fine shimmer that seems to meld with the skin, and reflects only a hint of shine, but gives skin a soft glow. 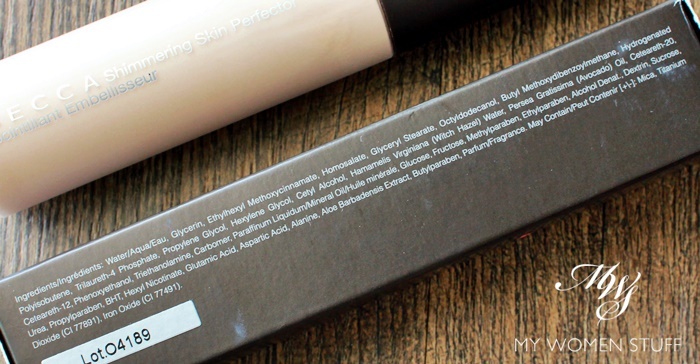 As the “Skin Perfector” tag implies, it does seem to make skin look even better than it already is! The shine imparted by this product is very subtle, which is basically how I like it. I don’t need to shine like a torch in the night. I just like to have luminous looking skin and this works perfectly. The only problem is that this comes in different shades, that will reflect light a little differently, so it was a little tricky for me to decide which to get. I eventually settled for Moonstone, a pale gold that promises a golden glow. Luckily for me, this was great for my needs! 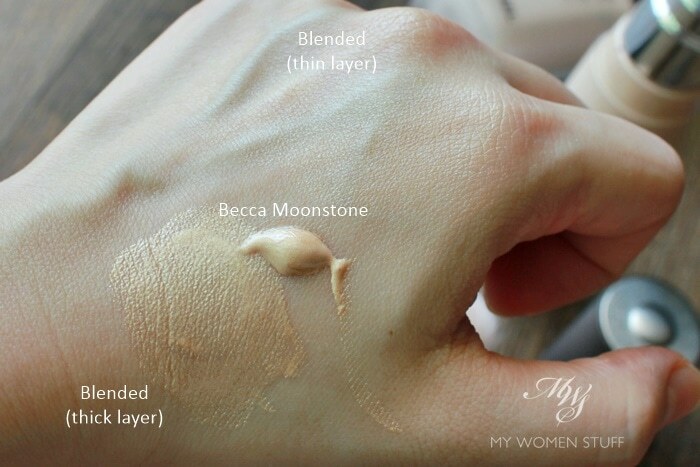 The Becca Moonstone Shimmering Skin Perfector is a pale gold with very subtle shimmer to it. The texture is very lightweight and does not feel sticky on skin at all. I do find that the pump does pump out quite a lot of product in one dollop, so I always have to be extra careful, as I only use very little of it each time. When blended thickly, the golden shine is quite noticeable, as you can see in the picture above. But once thinned out and blended out even further, all there is on the skin is a very subtle sheen of golden glow, that is very flattering. Use the Becca Shimmering Skin Perfector under foundation – if you use a slightly sheerer foundation, you can apply some of the product onto the skin before you apply the foundation, like a base. This gives a lovely glow, especially if you use a sheer foundation or BB Cream over it. Use the Becca Shimmering Skin Perfector as a highlighter – Use this on top of foundation where you want to highlight, tapping a little bit of product onto where you want it to go and blending it out gently with your fingers. The effect is much more subtle and flattering than many powder highlighters that seem to shine in the dark. Blend the Becca Shimmering Skin Perfector with foundation for an all over glow – This is my favourite way to use this product, and which gives a little magical boost to your complexion. I usually drop just 1 little drop into 1 pump of foundation (I don’t do a 1:1 mix as that’s too shimmery for my liking, so I only use a tiny drop for just a bit of radiance), blend it on the back of my hand and then apply to my skin. This works especially well with medium-full coverage foundation or foundation that has a satin or matte finish. A foundation with a glow finish might end up being too glowy. The Becca Shimmering Skin Perfector is a popular liquid highlighter with a very lightweight texture, and very fine shimmer that gives skin a subtle, luminous glow. The texture is not sticky, nor does it turn oily on skin, and the shimmer is very finely milled, so you do not detect chunks of glitter, only very subtle glow. There are numerous ways to use it, but I like it best blended with my liquid foundations to give them a little boost of radiance, especially for foundations with a more satin texture. It makes skin look beautifully glowy without looking shiny or oily, just perfect. There are a few shades to choose from, and I picked Moonstone, a pale gold that is very flattering especially for warmer toned or Asian skin. If you’re interested about what’s in the ingredient list, here it is. Have you tried the iconic Becca Shimmering Skin Perfector? Do you use highlighters a lot? These come in a pressed powder version as well as a cream version, both of which, I’ve read have more shimmer payoff. For me, this liquid version is perfect, because I like how subtle it is. I’m more about glow vs shine so I think I’m good in terms of texture and colour 🙂 If you’ve tried this, which shade did you pick? Oh noooo I was trying to hold off this, but now that I’ve read your review, I really GOT to have it! hahaha thanks for the review! I have Pearl and I love it! I like to apply it over those very matte Japanese sunscreens, as they tend to make my NC15 skin look very flat. I agree with the pump, it is difficult to control; I use half a pump but still end up wasting some products. Overall I was so pleased Becca’s SSP line I went back and got the Poured version in Pearl as well. Ooh I like the idea of applying this over sunscreen – like adding some dimension to the skin? What a great idea! And yes, the pump does dispense far too much product. I always have to be so careful to control it! I’ve been using moonstone for quite some time and love it! I agree that the pump can be challenging so I grabbed a travel jar, dispense a few pumps into it and now I just dip a brush into it when I want to use it. 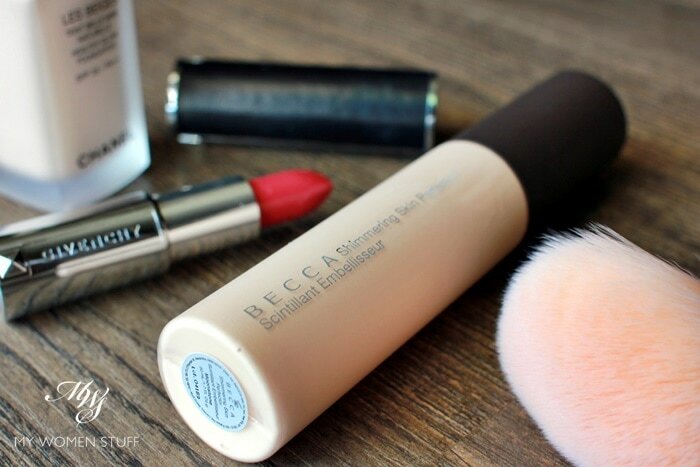 I also use the Becca Backlight primer which I do the same thing with in order to save product. It’s way too beautiful to go to waste. Glad you like it so much! I’ve heard too many good things about this! I just saw the Becca powders in person (so late about this hahah!) and damn they’re soooo beautiful! The glitters are a bit chunky though so I think it would look BEAUTIFUL on the eyes!!! I want to get one but I’m waiting for the palette one to come in. Hopefully I would be able to afford it when the time comes hahah! Yay for highlighters! I own the Opal and I have to say it is gorgeous, and very much unlike all the highlighters I’ve ever tried/owned. There is something very easy to use with this and i am sure it’s because they’ve put great thought into the ingredients. I usually mix it in with a moisturizer when i’m feeling like my skin needs a pick-me-up. I don’t use it daily but I might want to use it tmr since I am sick. Ah Champagne Pop was all over the internet! Do you like it? I hear it’s very shimmery though, much more than the liquid version! Thanks for the confirmation Evan! It’s nice to hear we’re getting more varied brands and products these days! I don’t use highlighters much, but I picked up a bottle in Pearl a few years back because of Lisa Eldridge. I thought it was a bit much using it as a highlighter (too much bling!) so I just left it in the back of the drawer for a while. Then, I used it in certain places on my face BEFORE foundation, and it was love. However, the bottle got sticky like NARS packaging so I decanted the product and threw away the bottle. Do you ladies knows why they become sticky??? That’s always puzzled me! I have an old but much loved Becca cream blush like you Paris (they dont make them anymore, so I’m making sure I hold onto it…. for as long as I can! *sob sob*) and it just suddenly became ‘sticky’ in my makeup bag, like as if I had let an ice-black melt all over it.. what the??? I think they degenerate too quickly, and heat might have something to do with it, although I’m not sure how true that is where you live! I do wish both Nars and Becca would just stop with these sort of packaging. It’s a definite dealbreaker! I have this too! I got the mini 20ml version in a squeeze tube when I was in the US and it’s great for dispensing small amounts. I tried picking up another mini in Opal from Sephora HK and there were so many issues… my order did not go through and I don’t think I’ll try again. I prefer liquid highlighters because they tend to look more glowy and dewy rather than metallic and shimmery. You might wanna check out NARS too, I like the 413BLKR illuminator that you can get at freestanding NARS stores. I got mine in New York but the store in Midvalley has it too. Eee a 20ml version must be adorable and so practical too! But you’re right about liquid highlighters being easier to work with. I have tried the Nars illuminators but they didn’t sit too well with me. Perhaps with the hindsight of having used Becca, I can give them another go 😉 Thanks for the rec! I hear that Champagne Pop is far too shimmery to be useful! So many people I know have eventually sold theirs haha! Hope you find a use for it anyway. The liquid ones however are as you say, perfection in a bottle! And I love that this stuff lasts FOREVER! You definitely get your monies worth!